About 60 years ago, at an undisclosed location, ground troops would sit for hours and sometimes days on top of a hill collecting information on our adversaries; a reconnaissance both dangerous and demanding. The grueling winter nights and scorching summer days made this mission an arduous one, but these Airmen were dedicated day in and day out. The Arizona National Guard’s 214th Attack Group, known as The Black Sheep, flies daily combat missions, providing troops on the ground with around-the-clock intelligence, surveillance, reconnaissance and precision attack capabilities. With launch and recovery elements of the MQ-9 Reaper at Libby Army Airfield in Fort Huachuca, the RC-26 Condor at Tucson International Airport, combat operations on the other side of the globe and operations at Davis-Monthan Air Force Base, the 214th AG and its remotely piloted aircraft have the ability to provide full motion video to support ISR operations down range. “You’re in the fight with them and providing valuable intelligence to help them do their job more effectively and efficiently,” said Staff Sgt. Terry Bessett, MQ-9 Reaper sensor operator. While the 214th AG has been charged with ISR missions, they also take pride in seeing the guys on the ground come home. From tactical to humanitarian, the 214th AG protects and defends by any means necessary. 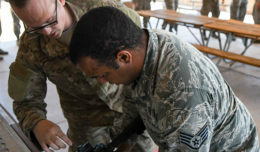 With the challenge of locating adversaries and collecting intelligence for extended time periods, the 214th AG continues to provide excellent service and maintain mission readiness to fight anywhere at any time.